Thymes Lavender Body Care Collection. 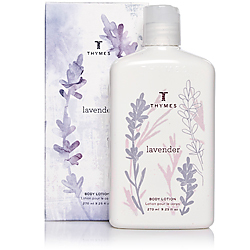 The Thymes Lavender Body Care Collection is a great way to pamper your body. The natural formula in this collection leaves skin soft, nourished, and refreshed throughout the day. Lavender bath and body care is a pleasure to relax with and soothes your body and mind. Relaxing Lavender blended with vital essential oils and the rehydrating benefits of shea butter, jojoba oil, honey, aloe and vitamin E. Aloe vera imparts its renowned healing benefits, while jojoba oil lavishly conditions. And honey, a natural humectant, draws moisture to the skin. You can also choose from other essential oil scents listed below to enjoy the gentle fragrance of Kimono Rose, Olive, Ambersweet Orange, Agave, Eucalyptus, Lavender or Wild Ginger. Thymes Bath Salts - 2oz.